Watch Dr. La Puma host Lifetime TV’s award winning “What’s Cooking with ChefMD®?, inspiring health-conscious consumers to look, feel and actually be measurably healthier with what they eat. Dr. La Puma also co-hosted Lifetime TV’s national cable TV series “Health Corner” every Sunday morning for over four years, with Leeza Gibbons and then with Joan Lunden. “Dr. La Puma’s ChefMD Shorts on PBS” and his Culinary Medicine FAQ on YouTube! feature his easy, fun, quickie takes on “foodutainment” : bite-sized nuggets from ChefMD’s Big Book of Culinary Medicine. 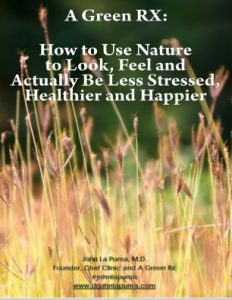 For more of Dr. John La Puma’s recipes and easy ways to look and feel younger with what you eat, join our community…free and get a free RealAge gift! Browse Dr. La Puma’s ChefMD Shorts for PBS, below. Dill is rich in fiber, iron and calcium, which along with vitamin D3, may help prevent osteoporosis. Sunlight converts the ergosterol in mushrooms to vitamin D2. The fiber in lentils helps regulate your blood sugar levels.